Rolling heavy duty 2 shelf plastic utility cart with wheels. 300 lb. capacity. 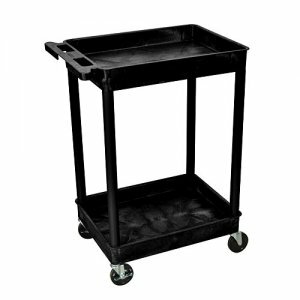 This durable multipurpose cart is great for industrial, janitorial and commercial applications. 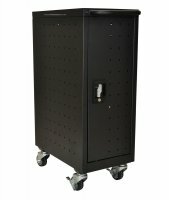 This Luxor STC11 utility cart is made of high density polyethylene structural foam molded plastic shelves and legs that won't stain, scratch, dent or rust. This STC11 cart is two tub shelves 18"D x 24"W x 37.5"H.
Clearance between shelves is 26".